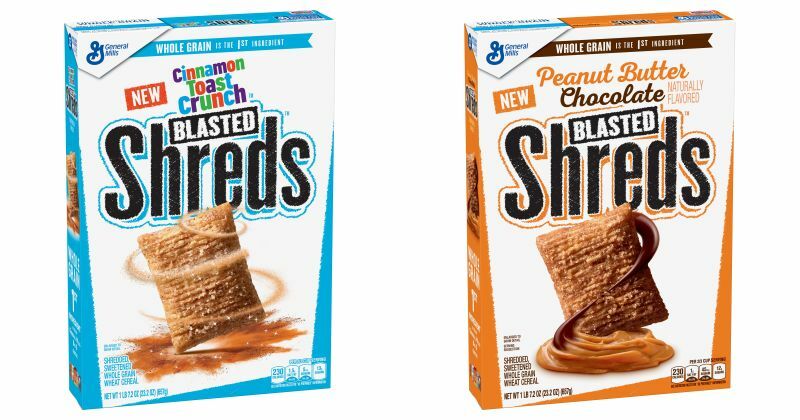 Looking to add bold flavor to shredded wheat cereal, General Mills rolls out new Cinnamon Toast Crunch Blasted Shreds cereal as well as new Peanut Butter Chocolate Blasted Shreds cereal. Cinnamon Toast Crunch Blasted Shreds feature shredded wheat cereal dusted with cinnamon sugar for a flavor similar to Cinnamon Toast Crunch, while Peanut Butter Chocolate Blasted Shreds the same shredded wheat but with the flavor of peanut butter and cocoa. Both flavors list whole grain wheat as their first ingredient and come in 23.2-oz boxes carrying a suggested retail of $3.99. They've already started appearing on shelves but are officially slated for a nationwide launch starting early January 2018.